In many games, there are certain bosses and enemies that players feel sympathetic with. Let's take Eliott from Shining Force for example - a honorable knight that just fights you because his king went evil and he swore allegiance to him. This is one of the easier bosses to be liked, but let's just take this one as an example. And there's Luca Blight. The son of Highland's king despises his father's plans to establish peace between Highland and the City State of Jowston. In order to motivate his people for his plan about continuing the war that has just ended, he decides to kill his complete youth brigade whilst selling it up as a breach of the peace treaty by Jowston. After he ignited the war once more, he turns out to be one of the most inhumane beings ever seen in a RPG. He lets his soldiers burn and plunder the villages of Jowston, and even kills innocent villagers. To make things worse, he humiliates them, lures them with a chance of living if they perform certain acts and kills them anyway. It is pretty interesting that this despicable human is not the final boss of the game and that he is more or less faced in the middle of the storyline. The way he is defeated, however, is astonishing. 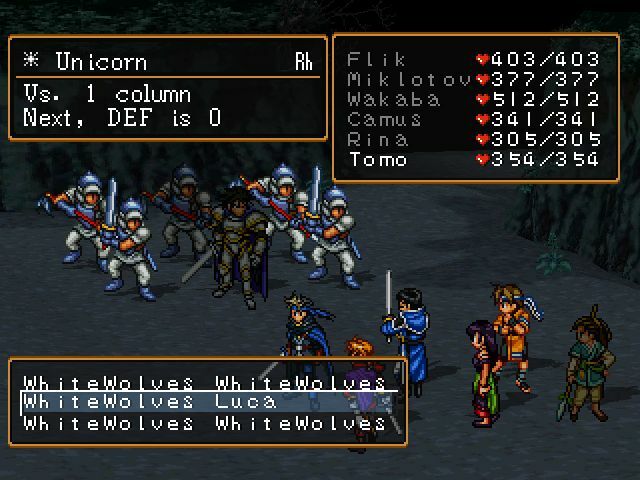 Players have to set up three full parties (of six characters per party) that will fight Luca Blight as he marches through a forest. This is about the only battle I know about where you have to fight a boss with 18 characters. 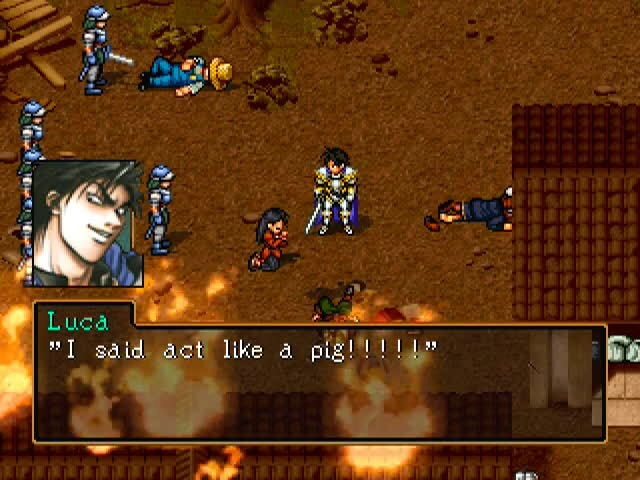 This is one of the fist times that Suikoden's unique feature of having up to 108 characters (or at least close to 100 if you deduct the characters that are not playable) really plays out. It's also pretty easy to level up party members in Suikoden, so you can easily train the other two parties. Luca is still pretty hard to beat. He has about the most HP of every boss in the game. When I first beat him, I wrote down his HP and counted them down to zero on a sheet of paper. And yet... even when you've beaten him, it's not over. You have to fight him in a two-against-two battle with Riou, the game's main protagonist. And believe me, you can still lose this battle. I did the first time I was able to beat him in the regular battles. And if you lost there - fight him with three parties, again. Back to the boss fights selection.